Programme Offered: PhD, M.Phil, Bachelor Degree, Master Degree, Post Graduate Diploma, Preparatory Programme, Diploma, Advanced Certificate, Post Graduate Certificate, Post Doctoral Certificate, Certificate Programme, Online Programme etc. 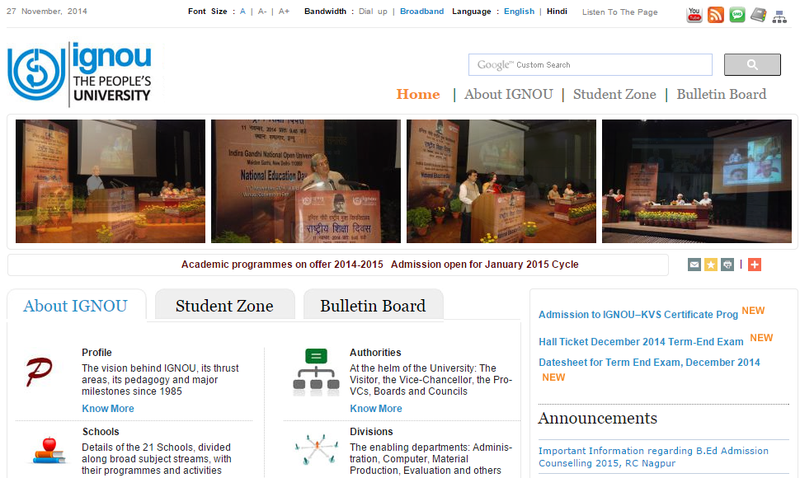 How to Apply for IGNOU January 2015 Cycle Admission? Visit any IGNOU Regional or Study Centre for Application Form. Fill it and submit it at the Regional Centre. Admission can be made in January or July. Prospectus and Application form can also be downloaded from the website. Application Fees and Course fees can be paid through Bank Draft in favor of IGNOU payable at the Study Centre Location near you. Once you application is processed and if you are eligible for the admission you will get a confirmation with Enrollment Number, Study Centre allotted, etc. You will be invited for Induction Meeting from the Study Centre and you will be provided the Study Materials at the time of Induction Meeting. You can Download IGNOU Term End Examination Form from the website. Visit the website http://www.ignou.ac.in and click on Online Submission of Exam Form for June 2015.Click to Submission of Form. Read the Guidelines and Instructions. Make Payment of Examination Fees and fill the Online Examination Form.